A technique for investigating the wetting behavior of water on phosphorene—the single layer form of black phosphorus—has been developed by A*STAR researchers seeking to better understand properties that could enable its commercial applications. Phosphorene, unlike other commonly used 2-D materials, such as graphene and molybdenum disulfide, possesses structural anisotropy, in which it exhibits different physical properties along axes in different directions. This property could allow phosphorene with tunable wettability to be fabricated for use in the biological sciences. Yet until now, little was known about the wetting behavior of this material. To realize the potential of phosphorene, however, requires a thorough understanding of how it interacts with biomolecules and fluids. 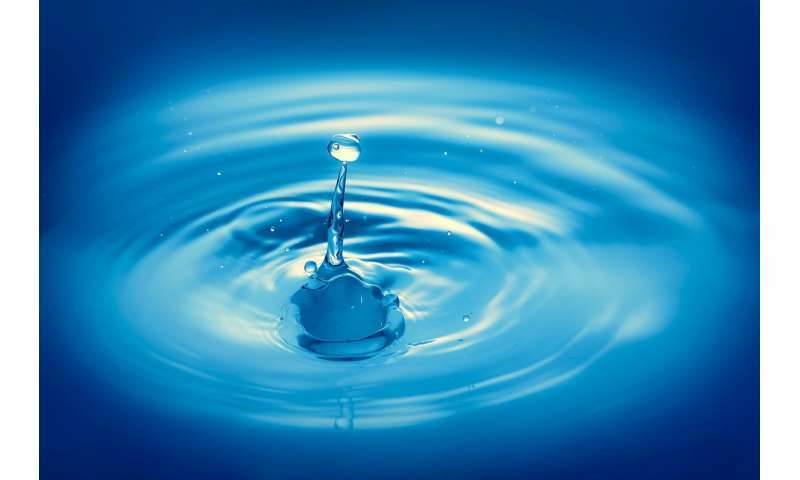 This drove Chen Shuai, and colleagues from the A*STAR Institute of High Performance Computing to develop a technique for investigating the wetting characteristics of water droplets on phosphorene. The researchers investigated the contact angle, a measure of the relative strength of the interaction between the phosphorene and the water droplets, which determines its wettability characteristics. Many properties of phosphorene, such as electronic band gap and atomic/molecular adsorption, are layer-dependent, so they also considered the wetting behavior on multilayer phosphorene. To do this they first used molecular dynamics simulations to observe the effects of different droplet sizes and the number of phosphorene layers on the contact angle. As phosphorene has strong structural anisotropy, they also explored the diffusion behavior of water droplets on phosphorene—both with and without defects—for their effect on contact angle. "The contact angle of a water droplet on phosphorene is important for biological applications of phosphorene," explains Chen. "Because it is an intrinsic property, we investigated the effect of water droplet size, number of phosphorene layers, and defect distribution on the contact angle of both pristine and defective phosphorene." "We found that the contact angle decreased when the number of phosphorene layers increased from one to three, but then converged to a constant value when the number of layers was larger than three," says Chen. "The results for defective phosphorene demonstrate that the contact angle along different directions increased with increasing defect concentration." The work demonstrates that the wetting property of phosphorene is tunable with the number of layers and the defect distribution, which are critical for manipulating the water wetting and protein adsorption on phosphorene-based devices for use in biological and nanofluidic applications. "Based on these results from our research, we now intend to explore the interaction of phosphorene with biomolecules in a water environment," says Chen.